Ordinary number signature Leng EF-UNC about 12,000 - 12,500 baht. Ordinary number signature Leng VF about 9,500 - 10,000 baht. Ordinary number signature Leng F-VF about 8,300 - 8,700 baht. The price was updated on 7th December 2017. The World War 2 in Asia was severely coming to the end in 1988. 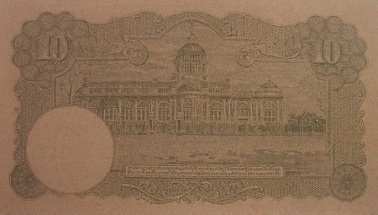 The banknotes that produced in Japan could not be delivered to Bangkok due to the Allies heavily attacks. The domestic banknote printing could not produce enough number of banknotes to meet the demand. In addition to the hike of inflation raised the demand of banknotes lead to the banknote shortage situation. Thai government had decided to take control to qualified state printing works and private printing houses to print notes. The banknote printing and signature printing were printed from different places for security control. The quality of the banknotes were low because of paper and ink shortage. Some type of banknotes were resized smaller than previous one and adjusted the process of signature and serial number printing to be at one time. 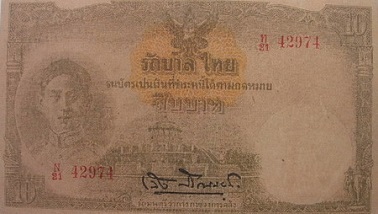 The 7th series 10 Baht type 1 banknotes were announced on 21st Febuary 1945. The main object is the image of King Rama 8 on the left. The middle image is Mahakarn Fortress. The serial code and number were printed with red ink.